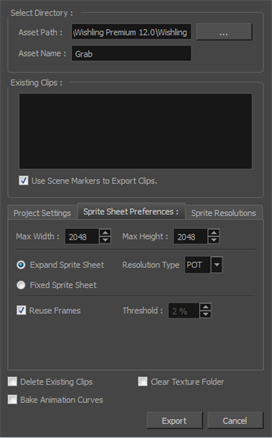 Displays a list of pre-existing clips in the same export folder location, most likely exported there from a previous time. Uses scene markers to define the export range, instead of exporting the entire scene—see Creating Scene Markers on Frame Ranges. Delete Existing Clips Select this option to delete any pre-existing clips in the export location. Clear Texture Folder Removes any information from the texture folder within the Harmony file. This has no incidence towards the Unity export but contributes to a lighter Harmony file.